What is it about monks and beer? The two just go together. And as craft beer continues to rise in popularity in the United States, the ones responsible for creating western brewing practices are reclaiming their own. This renewal is important for monastic life in providing another opportunity for monks to produce their own goods and to sustain their monasteries (in an age when many of their traditional farming practices are in decline; see an odd example in Mepkin Abbey’s controversy with PETA). St. Benedict affirms the necessity of the monk’s work: “When they live by the labor of their hands, as our fathers and the apostles did, then they are really monks” (Rule, ch. 48). Benedict also states that “the monastery should, if possible, be so constructed that within it all necessities, such as water, mill and garden are contained, and the various crafts are practiced” (ch. 66). Although this self-sufficiency is meant, in part, to insulate the monks from the world, the crafts Benedict mentions are important to provide an opportunity for the monks to witness to society. St. Benedict foresees the contribution of the monk on society: “Whenever products of these artisans are sold, those responsible for the sale must not dare to practice any fraud. . . . The evil of avarice must have not part in establishing prices, which should, therefore, always be a little lower than people outside the monastery are able to set, so that in all things God may be glorified (ch. 57, quoting 1 Pt 4:11). Though speaking of prices in particular (although aren’t Trappist beers the most expensive? ), Benedict wants the monks to glorify God when they enter into contact with the outside world through their products. This combination of bolstering monastic life and creating a more dynamic engagement with our culture has the potential for what has been called a Brew Evangelization. 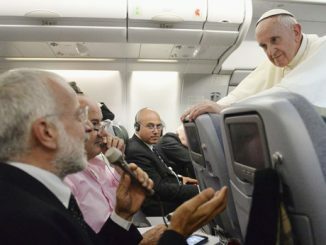 The New Evangelization is a renewed proclamation of the treasury of the Christian faith to meet the needs and challenges of modern culture, especially for those Christians who have fallen away from the faith. The revival of brewing is also a small recovery of monastic tradition. Monastic brewing can be considered a part of a general need for Catholics to reassert our presence and influence in modern culture. One brewery, which is certainly making a splash, is Birra Nursia, brewed by the Monastery of St. Benedict, an international community with many American monks, in Norcia Italy, St. Benedict’s hometown. Though only two and a half years old, the beer was actually served at the Papal Conclave that elected Pope Francis. Cardinal Pell, when blessing their expanded brewing equipment this last August, described their brewery as an “example of the new evangelization.” They have recently increased their production and have signed a contract with Interbrau S.p.A. to distribute their beer more widely across Italy, Europe, and possibly even the United States. The growth of brewing in Norcia is just one exciting example of more general growth. Just a year and a half ago I noted the remarkable resurrection of monastic brewing in the United States in my article, “Cause for Mirth: The Return of Abbey Brewing to the United States“. 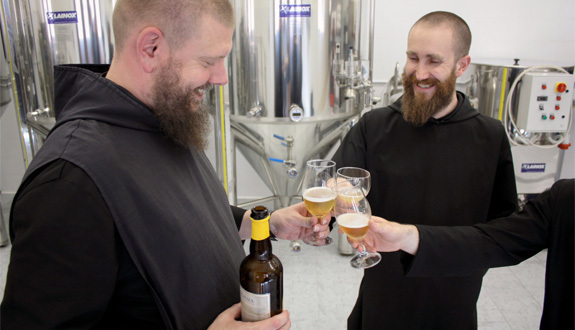 This resurgence in monastic brewing has only picked up more steam since then. I’d like to highlight a few ways in which this renewal has continued. Every batch is an act of faith, because you never know what it’s going to taste like until you crack the bottle open. It really is exceedingly gratifying. . . . Brewing beer is like baking, and baking is unlike any culinary art. Your formula’s got to be right. It’s always interesting. Around Christmas they also issued a limited release, St. Nicholas Christmas Ale. We, the monks at Mount Angel Abbey, in the spirit of a centuries-old monastic tradition, are dedicated to our craft for a higher purpose. We use pristine Oregon water, and hops grown in our own backyard and brewed in facilities located right on Abbey grounds. It’s a place where monastic life cultivates work and prayer, with every bottled brewed to the glory of God. We welcome all to enjoy our beer in food and fellowship, nourishing both the body and the spirit. A good summary of a Catholic brewing philosophy! The Benedictine Sisters do not want to be left out of this brewing renewal. The Sisters of Immaculate Conception Monastery in Indiana are making plans to open a brewery. The biggest news, however, is from the Trappists, whose brewing brand continues to grow: six beers in Belgium, two in Holland, one in Austria, and now one in the United States. First of all, the world’s consistently top-rated beer, Westvleteren, brewed by St. Sixtus Abbey in Belgium, issued a special release just for the United States. The monks, who only sell their beer out of their monastery in limited quantities (which is probably part of the reason it is wildly popular), needed a new roof. It is interesting that they looked to the United States for their special release: a pack of four 750ml bottles of their most popular beer, Westvletern 12, a quadrupel style, which sold for $85. People literally camped outside for the beer. I was not one of them, but to be completely honest I only heard about it afterwards! There are two new Trappist abbeys brewing in Europe. The first is Engelszell from Austria with four styles: Benno (dubbel), Gregorius (strong dark ale), Jubiläumsbier (Belgian pale ale), and Nivard (Belgian dark ale). The second new European Trappist beer is Zundert the second Dutch Trappist beer, brewed by the Abbey Maria Toevlucht. For about a year they have been brewing an amber colored beer that is currently available only in the Netherlands and Belgium. It has been received quite well, getting high reviews, and I give it my own hearty endorsement (though you have to be prepared to pay shipping charges to taste it). Brew Evangelization. Is this an exaggeration? Well, it might be, but only a bit. Of course, evangelization applies primarily to the direct proclamation of the Gospel. However, in our day it is becoming ever clearer that we need to evangelize—spread the good news—about the goodness and integrity of nature. This applies most fully to the goods of marriage and sexuality, but also to the basic simple goods of life. We’ve become so removed from the basic production of goods that reemphasizing simple things is also necessary for cultural renewal. Some have speculated that brewing lies at the very origin of human culture (by developing agricultural practices). In our advanced time, rediscovering the beginning, even with simple things, may be a good way to start over again. In this sense, monastic brewing may lead to a brew evangelization.